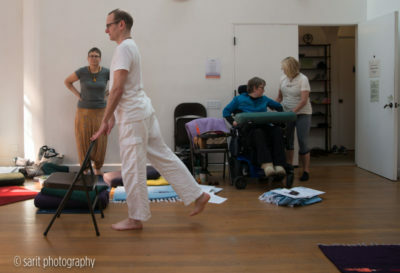 Jivana Heyman, founder of the Accessible Yoga Conference, admits that he is jealous of the talented people he knows teaching yoga at the conference in San Francisco October 6 – 8th. He laughs when he says this, exposing his staggering humility. He seems completely unaware that through his radiant love, he has transformed the suffering of others into inclusivity, healing and hope, and developed a worldwide sangha dedicated to bringing yoga to all people, regardless of ability. 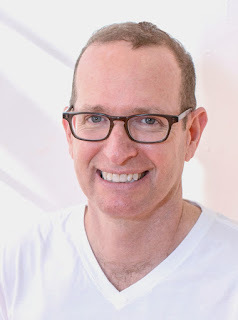 He works to change our skinny notions of what a yoga teacher should be. 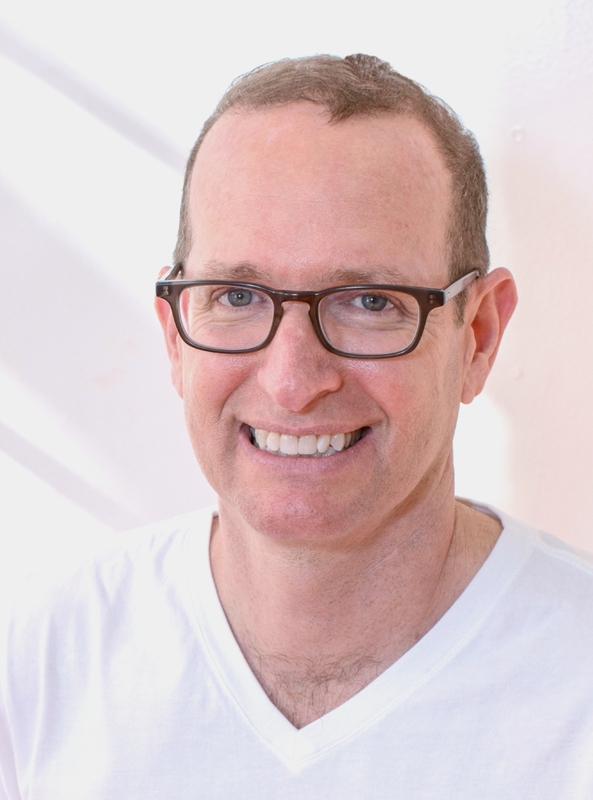 His passion to include everyone in the healing circle of yoga resounds in something he says often: “community is key to the resurrection of hope.” This incredible weekend conference will include asana classes, workshops, and panel discussions with senior yoga teachers on ways we can make yoga available to everyone. It was my honor to talk with him, learn about the sangha he is growing, and to feel his tender heart of love. I was around 17 when I came out. I decided I wasn’t going to lie anymore. Period. In yoga, the main teaching is how to be peaceful, how to find satya in all areas of life. It has set me free to help others. Truthfulness – as deeply as I can express it – extends to the broader community yoga practice as well. We have a misunderstanding about what yoga is as physical practice and as able-bodied persons. Who deserves the teachings of yoga? Everybody. Your life expands when you start realizing that yoga is not exercise. It’s more than that. People who are aware of what yoga really is should feel confident to step up, form community and make change happen. That means truly engaging, organizing, and speaking out. Come to the conference, do your own thing – write a blog, start a book group, teach a class, talk about what yoga really is. Speak out over a commercial yoga industry that has a lot of money for marketing. We have to overcome it at a grass roots level. The Yoga and Body Image Coalition is really changing the perception of who is a yogi. I think the danger is in thinking that “Yoga is not for me. I’m not flexible enough to do yoga.” I am always saying that it’s like I’m too dirty to take a bath. Tell us about your panel at this conference. This interview was originally posted on SF Yoga Mag. I was born with the most amazing teacher that never said a word. I could tell with a look in his eyes and his body language and gesture what he was thinking, what he wanted, and he was being mischievous. My teacher was my older brother and he has autism. Communicating without language was normal to me growing up. I knew that I would be working with people with disabilities from a very young age. Part of being autistic is you can’t express emotions in words. So this something that was never modeled. My brother could not say he was mad but demonstrated that with behaviors such as shutting down, bolting, or in severe cases breaking a window. When I was 12 and my brother was 16, out of the blue my parents split up and my brother was sent to live in a group home. In order to cope, I turned to drugs and alcohol. Sometimes I act out to get attention. My favorite example is when I decided to pierce my tongue because my father was a dentist. Somehow, I was able to pull it together to get through college. I was done with the drugs and moderated the alcohol. In 2009, my accountant said to go take a course for a tax right off. I chose Yoga for The Special Child. They taught that this is not just another therapy. In order for this method to be as affective as it is meant that I would have to work on myself in order to help my clients. When I heard that, I wanted to run. That was not what I signed up for. I felt like I was in a foreign country and did not know the language. I stuck with it and felt amazing by the end. So amazing, that I was able to get off some of the prescription medications I was taking. I began seeing very quickly this method was more effective than traditional occupational therapy. Many times, the results were surprising. For example, I had a 9-year-old with Rett’s Syndrome. This is a genetic disorder that causes children to lose developmental skills over time that they typically are not regained. Through yoga, she was able to regain skills that were lost. Rett’s syndrome has a hand movement pattern and in this child’s case her hands were always in her face. The first time she could see down the hall because her hands were relaxed she stopped at every bulletin board and just stared like she had never been able to see them before. It was truly amazing to watch. Another time, I worked with a group of boys that had severe behavior disorders. Most of their school day was spent in time out. The 30 minutes they were in my therapy group they remained out of time out. I had this same group for 2 years. My supervisor came to watch as part of my annual review and she was in tears by the end of the session. Right now I work an adult with cerebral palsy. Usually the muscles in his body are always moving and he is not able to remain still. Over time using yoga with him his body was able to be still. The first time this happened it reminded me of the way my brother communicated through eye gaze. I could see him smiling even though he was afraid to smile in fear or firing off all his other muscles. What’s significant is that, I am using yoga in the physical rehab setting and seeing results. Patients improve faster. The success stories go on and on. It so fulfilling for me other share complementary options to traditional therapy like yoga and make it accessible for people with disabilities. Sometimes, in order to help these people get outside the box they live in, we have to think outside the box ourselves. The recent death of beloved yoga teacher and writer Michael Stone has been haunting me. I think there are some important lessons in his personal struggle that we need to learn from as a yoga community. Even though he was teaching the world how to deal with the pain of our human existence, he was personally dealing with bipolar disorder, which he had not publicly discussed. I have no problem with yoga teachers keeping their personal problems to themselves, because that’s what healthy boundaries are. We are there to serve our students and not just talk about our own issues, especially if they’re unresolved. For myself, it is a constant struggle to find a balance between over-sharing and being authentic in my teaching. What I’m concerned about is the idea that as a yoga teacher we have to achieve some kind of perfection in our own lives and that our faults somehow reduce our capacity to teach. In fact, I think it’s the other way around: our personal challenges make us more effective teachers because we are forced to apply the teachings in our own lives. 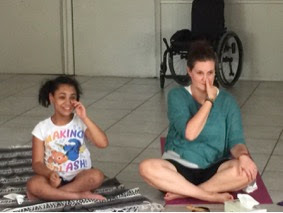 Accessible Yoga, the organization I founded, is dedicated to changing the consciousness around who can practice yoga and who can consider themselves a yogi. If, as yoga teachers, we try to force ourselves into a perfect mold, only sharing the attractive parts, only demonstrating the poses we’re good at, then we’re digging a hole for our students. If we can show our students that we are also struggling, and if we can be honest about our own path, then I think we have the opportunity to lift our students up with us. In fact, we lift the whole yoga community any time we speak honestly and with integrity. Unfortunately, these days we see that aspirational marketing seems to work really well. We look at the covers of yoga magazines and that somehow inspires us to want a perfect body and a perfect life (as if that actually exists!). So when yoga teachers neglect to share their truth, they contribute to a communal delusion that yoga is for some and not for all. Personally, my interest in spirituality began when I was about eleven years old and I realized I was gay. I felt divorced from the “normal” life I saw around me. It was a horrible feeling, and I was miserable for many years. Ironically, that feeling of being an outsider is at the core of the spiritual teachings. The ability to be the witness and stand apart from our ego and connect to a deeper place within us is what yoga is all about. It took many years for me to accept that I was gay, and even longer to acknowledge the beauty of being different and of being the outsider. Then in the late 80s I was surrounded by friends dying of AIDS and it was devastating. Only by confronting that pain was I able to do something positive in response, and that was to bring yoga to the HIV/AIDS community in San Francisco. Those early classes are what led me to begin sharing yoga with people with disabilities and that’s what eventually grew into Accessible Yoga. The truth is no one deserves the yoga teachings more than anybody else. These teachings, like all spiritual understanding, are universal truths that belong to everyone regardless of ability or background. As yoga teachers, it is our job to find ways to make these teachings accessible and universal. If we control and limit them, we are exposing a limitation in our own understanding. Most of us are striving for equality in our communities, both socially and economically. But if we don’t have equality in spiritual teachings then we’re really in trouble. Let’s take our yoga teachers down off of their pedestals, and give them a chance to be human with all their weaknesses and all their problems. In our shared humanity and suffering, we can join hands and support each other to dive deep inside where all yoga teachings take us—to a place where we are all perfect and free. Thank you, Michael Stone, for continuing to teach us, even in your death. This was originally posted on the Yoga for Healthy Aging Blog.